Calculate EE bond interest with the online calculator. 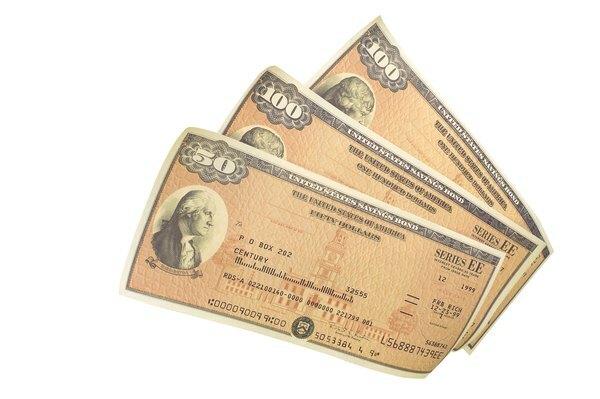 Series E savings bonds were first sold in 1935 as a way for the U.S. Department of the Treasury to raise money to fund government operations. In return, savings bonds were a safe investment with an interest rate usually higher than what bank checking or savings accounts offered. Nowadays, the E bond has been replaced by the electronic EE, which can be purchased directly from the Treasury Department. The Treasury has an online calculator available to quickly determine the interest your EE savings bonds have earned. Just go to Treasury Direct and follow the link to the online calculator. Start by selecting the date you want the interest calculated to and enter it in the Value as of block. Be sure EE is showing in the Series block. You do not need the bond’s serial number in order to use the calculator. Now select the bond’s denomination from the drop-down box. Enter the issue date information using a two-digit number for the month and four digits for the year. For example, if the bond was bought in November of 2008, you would enter the information as 112008. Click on the calculate button to see how much interest the bond has earned as of the date you entered in the Value box. You can build an online portfolio to keep track of the total interest your bonds have earned. When you finish calculating the interest on the first bond, enter the Value as of date, select the denomination and enter the issue date for the next bond. The calculator will automatically retain the data you entered. When you have finished entering the information for each bond, click on the save button and the calculator will save the information for you. The Treasury also has developed a software program you can download to create an inventory of your savings bonds. The Wizard can import and export files saved as .htm or .csv, keep track of the bonds you have cashed in or exchanged and calculate the bond’s yield-to-date along with the six-month yield rate. The Wizard can produce a variety of reports and is free to download and use.